My in-laws have a cottage on lake Memphramagog in the Eastern Townships of Quebec, Canada. We go up a few times a year and whenever we go I stop off at Jewett’s store- the only convenience store, or dépaneur- for miles around. It is piled high with everything from fresh eggs to fireworks. If Jewett’s doesn’t stock it, chances are you don’t need it. I got this honey, “Natural Raw Honey,” there. It turns out it is produced by a cousin, Bob, in Ontario, and they are trying to help him out by selling it in the store. The label tells me a little about Bob – that he owns a Bed and Breakfast and Apiary, that he is a spiritual man, and that he thinks honey is good for your health – but his website tells me a lot more. Cousin Bob is Bob Shearer, and in 1996 he bought 50 acres of land in the Beaver Valley near Flesherton, Ontario, and built the Victorian house that is now the Tahitian Noni Place B&B that he runs with his family. 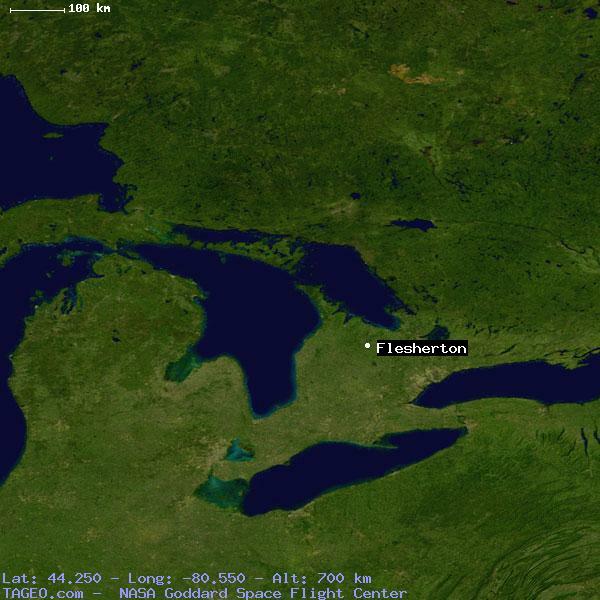 To help you locate Flesherton, it is northwest of Toronto, west of Barrie, and south of Georgian Bay. The countryside around Flesherton is beautiful- wooded lands spotted with small quaint towns and farms- just think ‘Canada’ and you probably have the right image. The South Georgian Bay tourist website suggests that there is a lot to do and see in the area, especially outdoorsy things like cycling and canoeing. 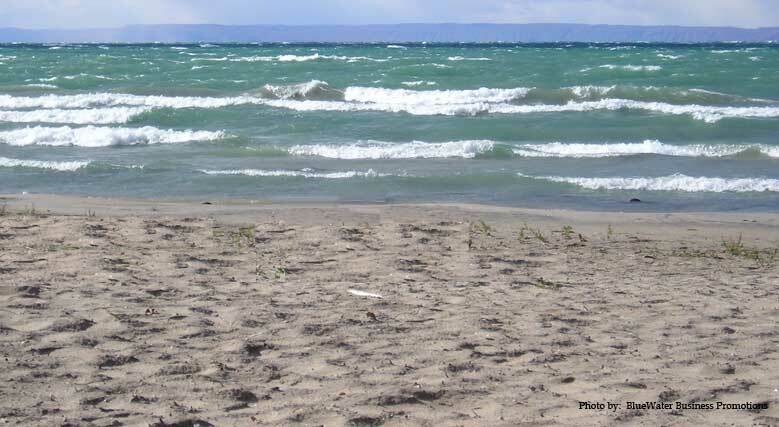 They also have photos of people enjoying the beach and splashing in the surf of the Georgian Bay. The caption reads “sun and fun on the beach, leave your footprints in the white sand.” It is brilliant and utterly mad. Even in peak summer that water has got to be about freezing. Canadians are a hearty lot, though, to be sure. To fully understand how superb this tourism campaign is, I’ve included a photo of Woodland beach. Doesn’t it look inviting? Now, about Bob’s honey. Unfortunately the label doesn’t tell me much, other than it is natural and raw (unpasteurized). 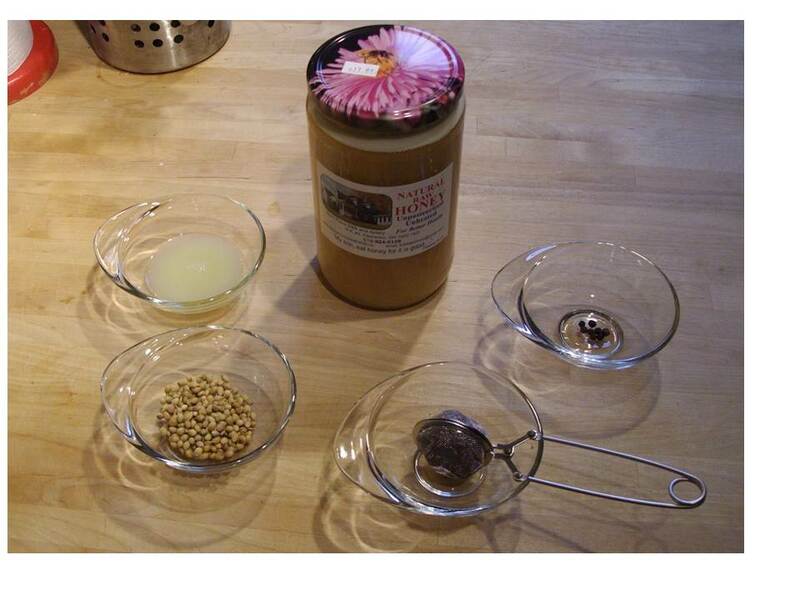 I’m assuming it is wildflower honey. It is a creamy, somewhat thick with a nice yellow opaque color. 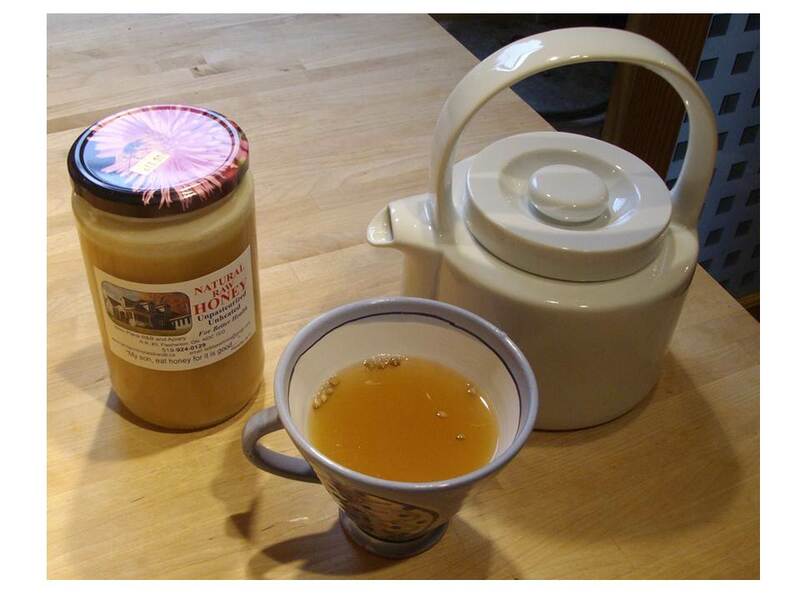 It doesn’t have a complicated honey taste, just pure honey sweetness from beginning to end. The texture, though, is a bit interesting. It has a very fine grainy texture that then melts in your mouth. This is a very good quality table honey, perfect for baking or cooking when you want honey sweetness but think an exotic honey flavor might be lost in the mix. In a medium saucepan boil 4 cups of water with 3 teaspoons of coriander seeds and 6 black peppercorns. Simmer for 15 minutes. Pour the spice water into a teapot. Add 1 teaspoon of loose black tea (decaf works just fine too), 2 tablespoons honey, and 1 tablespoon of lime or lemon juice. Let steep for a bit and enjoy! This entry was posted in guest blog, recipe. Bookmark the permalink.